Aciclovir is a medical treatment subject to prescription that is intended to reduce the pain caused by shingles, but also genital herpes. Herpes is usually transmitted through sexual contact. The generic version of Aciclovir, Zovirax, operates in the same way. There is to date no treatment to cure herpes. Aciclovir is a treatment intended to relieve the pain caused by the herpes virus, as well as shingles. Cold sores can also be treated with Aciclovir. Developed by Actavis Laboratories and patented in 1979, the treatment aims primarily to treat diseases caused by the herpes virus. Genital herpes, cold sores and also chickenpox are many diseases that can be treated with Aciclovir. The active substance, Aciclovir, can be used in two different ways. The first way is therapeutic, in order to combat the virus. the second way is precautionary. When used in a lower dosage, the treatment can indeed be used to prevent a potential risk. A key feature of this treatment is to increase immune defences. Patients with viral diseases such as STIs can also use the treatment. A major benefit of the treatment is its duration of use. Unlike other medical treatments that can be perceived as heavy, Aciclovir’s duration of use of is very short. Aciclovir is available in two forms: as a cream, or as a tablet. According to studies on patients treated with Aciclovir, treatment is very simple and comfortable to use. The very short delay in effectiveness might also be a reason why the treatment is praised by both patients and physicians. Although the herpes virus cannot currently be cured, the antiviral medicine Aciclovir reduces the disease’s pain and leaves the virus in a passive mode, in a sleep state. Aciclovir works by preventing the herpes cells from reproducing and multiplying, and therefore stops the duplication of these cells. By preventing the virus from spreading further into the body, Aciclovir also stops the healthy cells from becoming infected with herpes. When at work, the antiviral can influence the polymerase enzymes. What are the advantages of buying Aciclovir? Doctors often prescribe Aciclovir to patients suffering from cold sores and genital herpes. Aciclovir is a generic version of the drug Zovirax. It consists of the same active ingredients and produces exactly the same effect. When a herpes outbreak occurs, Aciclovir helps speed up the healing process. It is also very effective in preventive action; that is to say, when the patient notices the appearance of the first signs of an outbreak, even before the blisters and wounds arise. The preventive application thus limits the intensity of attacks. Herpes is one of the most commonly transmitted STIs in UK. This virus is characterised by the appearance of blisters and painful sores. Although in general transmission of the virus is associated with sexual contact, it is possible to transmit HSV-1 indirectly (usually associated with labial herpes) via sharing glasses or utensils. HSV-2 (usually associated with genital herpes) is usually only spread by sexual contact. When the virus is in remission, it is not contagious. But it becomes especially contagious when signs of a herpes attack occur, and throughout the following period. In order not to infect others, it is advisable to avoid sexual contact until the affected area is fully healed. Currently, there is no permanent cure for herpes, and once contracted, the virus remains present in the body of the infected person for life. Symptoms occur when the immune system is weakened (from illness or fatigue). But although the virus does not disappear, the frequency and severity of symptoms decrease with age. Treatment for HSV aims to accelerate the healing process and reverse reactivation of the virus. Aciclovir is an extremely effective treatment for herpes because it works quickly to relieve symptoms during the active stages of an outbreak, and prevent outbreaks at the other stages of the disease. According to studies, patients consider the effectiveness of treatment to be 4 out of 5. What is the active ingredient of Aciclovir? The active ingredient of Aciclovir is a substance of the same name, belonging to the class of antiviral drugs called analogical guanosine and which was developed in the second half of the twentieth century. Today it is a very popular drug. Aciclovir works by inhibiting the growth of viral cells, which attempt to divide and multiply upon reactivation of the herpes virus. When the infection restarts and tries to progress, it emerges with the materialisation of genital and oral blisters, or cold sores, depending on the strain of the virus. To accelerate growth, the virus must convert an enzyme called DNA polymerase. 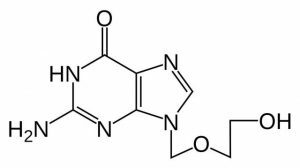 Aciclovir inhibits this conversion process and limits the development of the virus. Once it has stopped the growth of the virus, the immune system is able to fight off the infection. This medicine may not permanently cure herpes, but it accelerates the disappearance of symptoms. Aciclovir should be taken at the onset of symptoms. The dosage of treatment depends on the medical examination conducted by the doctor. Depending on the specific type of virus and severity of the patient’s symptoms, the doctor may prescribe different dosages. Genital herpes & labial herpes: the doctor usually recommends taking 5 200mg tablets every day for 5 days. As a preventive measure against herpes: the doctor recommends taking one 200mg tablet four times a day for six to twelve months. Shingles treatment: the doctor recommends taking 800mg of Aciclovir (200mg, 4 times), 5 times a day for a full week. Aciclovir can be taken before, during or after a meal, food does not influence its activity. Antivirals, like all treatments subject to medical prescription, can cause side effects, including Aciclovir. However, be aware that not all patients will experience adverse effects from taking this herpes treatment. Only one in 10 is affected by the side effects associated with taking Aciclovir. If you have significant side effects and if they do not fade with time, you must immediately seek the advice of your doctor. Other rare side effects may also occur, such as jaundice, dizziness or feelings of confusion. The vast majority of adults can use Aciclovir to treat the herpes virus. The treatment is contraindicated for pregnant women or those trying to become pregnant. The antiviral is not recommended for nursing mothers, people with diabetes or those taking treatments such as cimetidine, zidovudine, or even cyclosporine. 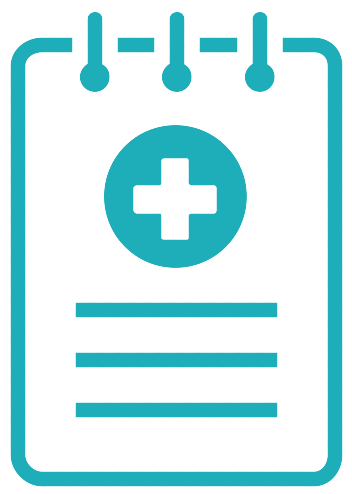 When consulting with your doctor, you must submit a list of medications you are taking. How should Aciclovir be stored? As an antiviral, Aciclovir must be kept out of the reach and sight of children. The treatment should be stored at a temperature not exceeding 25°C. We also advise you to check the expiry date on the package. If this is exceeded, we ask you not to throw treatment in your household garbage for reasons of respect and protection of the environment. The easiest way to dispose of it is to bring Aciclovir to a pharmacy, where they will destroy the drug. How do I buy Aciclovir Online & in UK? Aciclovir is a treatment subject to medical prescription, which means that you cannot buy it without a prescription. In order to get a prescription, the simplest and most widely used solution is to make an appointment with your doctor to perform a medical examination. If the doctor believes that your condition requires the medication to treat herpes, he will give you a prescription. Once equipped with this, you can buy Aciclovir in a pharmacy. 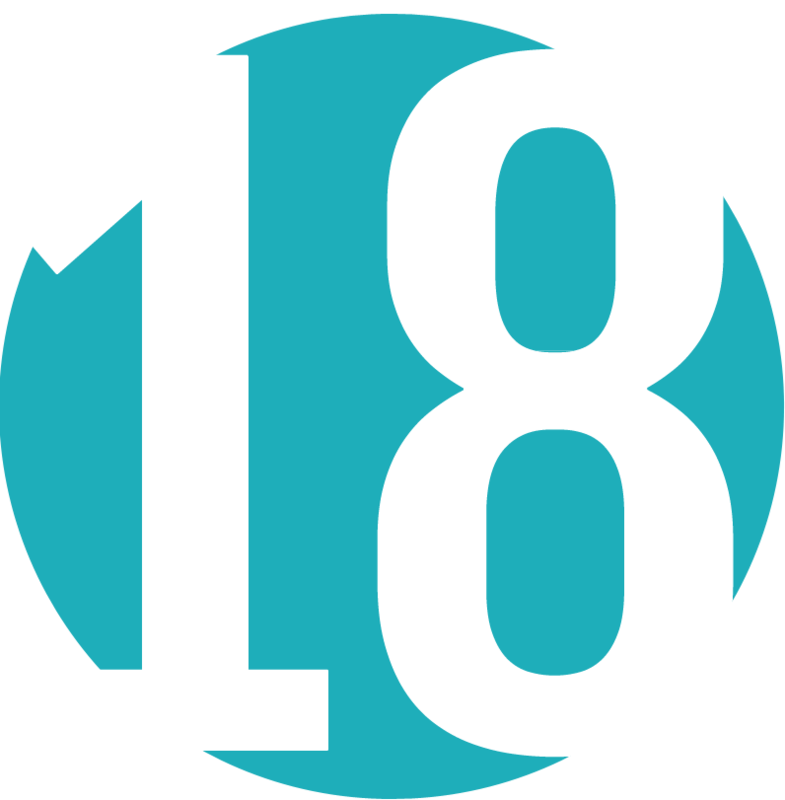 It is not always easy to talk about herpes and other sexually transmitted infections with your doctor or pharmacist. 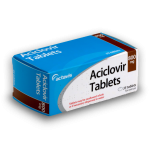 For reasons of confidentiality, it is now possible to buy Aciclovir online. Indeed, some online clinics allow patients to perform an online consultation to check if the patient’s condition allows him to take the treatment without risk to their health. Buying online has to be done on a website offering a genuine consultation, which is controlled remotely by a medical team. Only buy Aciclovir if you are sure that the treatment is real. Before purchasing Aciclovir or other prescription medication online, please check with the health agency that your country of residence depends on. Indeed, legislation for the online sale of prescription medication differs depending on the country. Note especially that, although England and Germany allow the purchase of prescription medication on the internet, this is not the case in Spain or France. What is the price of Aciclovir online & in UK? As stated above, Aciclovir, the treatment for genital herpes, is only available on prescription. Pharmacists are then allowed to choose the price of the drug at will. They can decide to increase or decrease its price based on their costs and margins. Know that the treatment is not reimbursed by social security. In pharmacies, the price for 25 tablets of Aciclovir treatment varies from £25 to £35. It is also necessary to add the cost of your doctor’s consultation to this price. Online prices are very competitive, and depending on the website, they range from £25 to £45 for 30 tablets. Depending on the website, the prescription and the delivery charges might be included. Caution: Alfadoc always recommends that you go to your doctor to perform a medical examination and obtain the prescription for you to purchase the genital herpes treatment in a pharmacy. However, if you wish to order online, beware of websites offering you low prices and promotions such as “cheap Aciclovir” or “Aciclovir without a prescription.” These sites often sell counterfeit drugs.